↑ "The Best of The Best". Rec.Sport.Soccer Statistics Foundation.com (19 June 2009). Retrieved 31 March 2013. - "Camacho: Maradona was, is and always will be the best in the world". marca.com, 12 March 2014. – "Ruud Gullit: Diego Maradona is the best ever in my opinion". goal.com, 29 July 2012. – "Lionel Messi: Diego Maradona is the greatest of all-time". SoccerAnchor, 7 September 2011. – "Paolo Maldini: Maradona best ever, Ronaldo close second" Paolo Maldini fan page, 21 July 2008. - "Hector Enrique: Messi will never surpass Maradona" goal.com, 3 March 2014. - "Wayne Rooney: Diego Maradona is the greatest player ever" SoccerBlog, 25 March 2006. – "Glenn Hoddle: Diego Maradona is the greatest player of all time". SoccerBible, 22 July 2010. – "Ryan Giggs: Maradona is the best of all time". tribalfootball, 11 October 2011. – "Rio Ferdinand: In my eyes Maradona is the best footballer ever". fifa.com, 7 November 2008. – "Mario Kempes: Maradona is absolutely the best". ESPN soccernet, 18 April 2005. - "Luca Caioli: Maradona greatest footballer". Times of India, 30 April 2014. – "Aguero: It is disrespectful to compare me to Maradona". Mirro Football, 20 November 2011. – "Frank McGarvey: Diego Maradona was world's best player". Daily Record, 30 October 2008. – "Gordon Smith: Maradona was the best player I ever saw play the game". Daily Record, 30 October 2008. 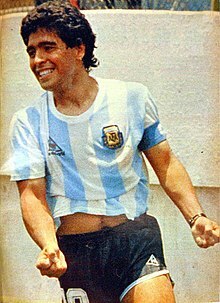 – "Trevor Edwards: Maradona is best" Central Telegraph, 11 April 2012. – "Maradona’s still number one". The Sun, 29 April 2011. – Sir Alf Ramsey: "Pele had nearly everything. Maradona has everything. He works harder, does more and is more skillful". Hindustan Times, 5 May 2004.